First HTC Droid DNA promo video surfaces, touts "The Ultimate Smartphone"
HTC put everything it is capable of, and it is not little, into the latest surprise for the year, its Droid DNA behemoth just announced as a Verizon exclusive. The phone's main selling point is its large 5" edge-to-edge screen with Full HD resolution, the first of its kind with 440ppi pixel density, which should be a sight to behold. Every major hardware and software improvement the company has come up with lately are also thrown in there, like Beats Audio and dedicated speaker amplifiers, wide-angle front camera, the ImageChip ISP and latest Sense 4+, plus HTC has wrapped it all up in a very thrilling promo video. Being one of Verizon's DROID line, the DNA video strikes on the high-tech nature of the phone, but it is far from a clunky giant, since the chassis is very slim and elegant for this screen size. Have a gander at the promo video below, with the music eerily reminding of the Resident Evil franchise. Galaxy S3 killer but not Galaxy note 2.Galaxy S4 will definitely kill this one in next year. In software, I will say "Yes" because Samsung will just get this point toward. 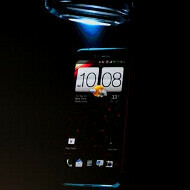 About the display, "No" because Super AMOLED display can't get 1080p resolution yet, although there's rumor about it. okay i love samsung and the Galaxy line both S and notes ! but come on ! this phone is amazing ! although its not a phablet... so shouldnt be compared to GNote 2, specs wise it beats both GS3 and GNote 2, but for sure GS IV will be better, same thing GS2 vs htc sensation, and GS3 vs One X ! now droid DNA vs GS IV samsung will win once again, but still this is the BEAST !!! hahahahaha your comment make me laugh really damn hard. Niice phone too bad I can't have it haha. Battery size killed this phone, unless they are planning a Maxx version using Motorola's battery tech. All Droids will come in two flavors, regular and super sized battery. That would interesting if VZW actually started doing something like that, because such a beastly phone with such a small battery and low entry price makes you think there is another phone incoming with much larger battery size. 2020mAh battery with a 1080p screen I don't see how this thing can last 5 hours of mixed usage especially with such a large screen. When will PA get their hands on this thing to put it through it's paces? not a bad strategy really.. I would just like to see Verizon/companies TELL the public that the Maxx phone is coming.. so they can make a choice between $199 for the smaller battery now, or wait a little and get the bigger battery for presumably a bit more. Having said that.. I HOPE HOPE HOPE in the near future HTC comes up with some kind of new design.. this phone to me looks just like my wife's 3yr old Incredible.. and Rezound.. and... They all look the same! What good is a "promo video" if it tells nothing about a device except the name of the device, what carrier it's on, and the manufacturer? I say this was a waste of money, in a way, and time. really aweosme device!! i want one too!